George Chuvalo squares off against Muhammad Ali at Maple Leaf Gardens in 1966. As the bell rang for the fifteenth and final round, George Chuvalo stepped forward to meet Muhammad Ali at centre ring as the Maple Leaf Gardens crowd roared. By most observers’ count, the Toronto-born heavyweight had only won one round—on sheer determination alone—and needed a knockout for victory. The match faced Chuvalo against the brash young heavyweight champion, undefeated as a professional but reviled by much of the American press and public for his refusal to serve in Vietnam. A last-minute substitute to the fight, Chuvalo was considered a has-been on the down side of his career by the boxing establishment. He was the prototypical “coulda been,” with a promising career that regularly saw him near the top of the heavyweight boxing rankings, but seemingly unable to put it together in the high profile fights. Now, he pushed Ali to 15 rounds for the first time in the American’s boxing career. It was the first time a heavyweight title bout went the distance since 1954, and one of the most memorable fights ever to take place on Canadian soil. 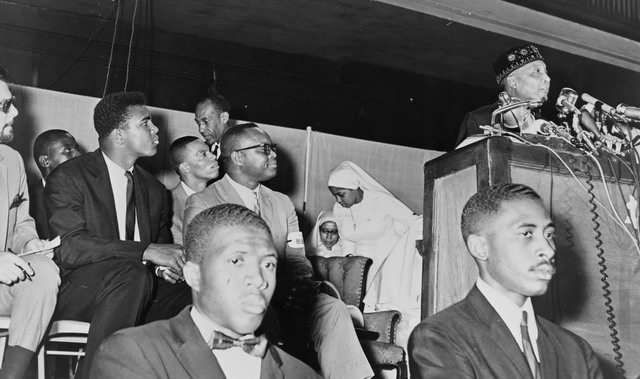 Cassius Clay listens to Elijah Muhammad speak, 1964, from WikiMedia Commons. Since winning gold at the 1960 Olympics, Cassius Clay (as Ali was then known) quickly worked his way through the heavyweight ranks en route to unseating Sonny Liston as the World Heavyweight Champion in February 1964. Fighting in an unconventional style—”fast footwork, hand held low, a defence that leaned back, bobbing and weaving,” as historian Bryan Palmer described it in Canada’s 1960s (University of Toronto Press, 2009)—Clay riled the (predominantly white) boxing establishment with his bravado and bombastic trash-talking. After he’d changed his name to Muhammad Ali as part of his conversion as a member of Elijah Muhammad’s Nation of Islam, he was called to appear before the United States Selective Service. Although he’d already failed a section of the induction exam and been deemed ineligible, the escalating demands of the Vietnam War meant lowered entry standards. For Ali, it meant that in February 1966 he was reclassified as eligible for selection. Announcing his intention to refuse service as a conscientious objector with an infamous comment—”I ain’t got no quarrel with them Vietcong,” he said—Ali sparked nationwide controversy. 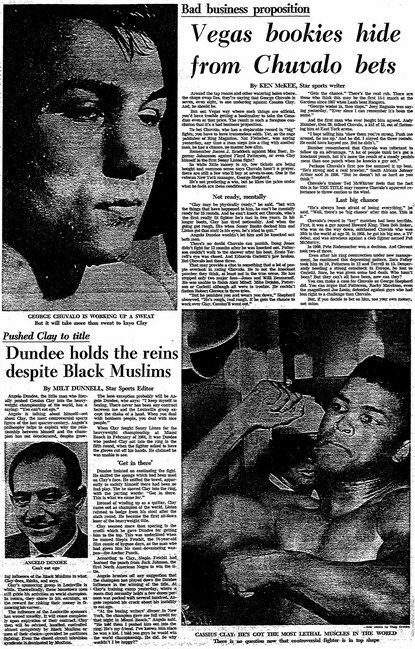 Years before broad public opinion turned against the war, already hostile white sportswriters, who’d long painted Ali as a loudmouth and as a member of what they considered a black extremist organization, could now include “unpatriotic draft dodger” in their attacks on the boxer. 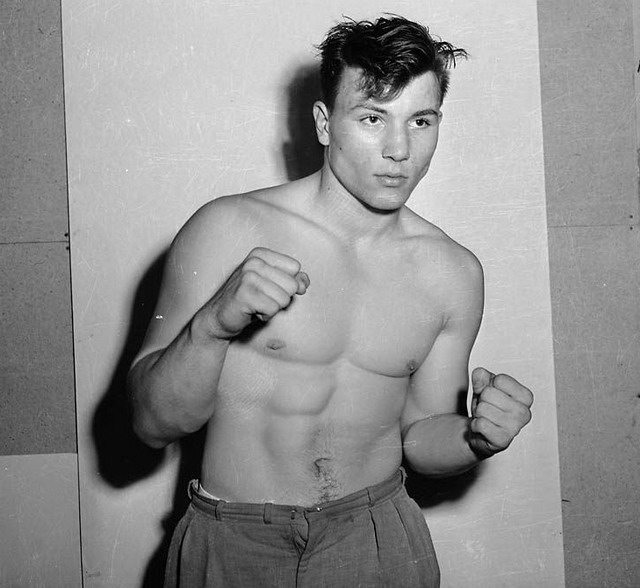 A Young George Chuvalo from the City of Toronto Archives, Fonds 1257, Series 1057, Item 2470. By 1966, 28-year-old George Chuvalo was on the down side of his boxing career. Born to immigrant parents from Bosnia-Herzegovenia, Chuvalo had grown up in working-class instability in Toronto’s Junction neighbourhood. And he took to boxing as an alternative to his father’s fate of working at the abattoir. First teaching himself boxing basics by studying photos in magazines, Murray Greig writes in Goin’ The Distance: Canada’s Boxing Heritage (Macmillan Canada, 1996), Chuvalo was the Canadian amateur heavyweight champion at age 17. Then, he turned professional in April 1956, taking a $500 purse for knocking out four opponents in a tournament at Maple Leaf Gardens. But managers and promoters, starved for legitimate boxing talents, rushed Chuvalo into gruelling headline bouts. He earned the Canadian heavyweight belt by 1958. He never developed into a well-rounded boxer because he’d never been given the opportunity to refine his boxing fundamentals in shorter undercard matches. Relying on his sheer size and strength, Chuvalo moved relentlessly forward at his opponents, absorbing their punishing blows on his body and face, and wailing away in counter-attack. It was a style that once led to Ali dubbing him “the washer-woman.” Inconsistent in the ring, Chuvalo lost the Canadian crown but regained it shortly afterward. He had his shots at earning a world title, but always seemed to falter in the big fight. In February 1965, he went the distance against former champ Floyd Patterson at Madison Square Gardens but lost a close decision. He lost his next major bout against top contender Ernie Terrell in a unanimous decision, a bitter outcome that Chuvalo remains convinced was fixed. After a win against Joe Brygraves, Chuvalo unexpectantly dropped a decision against Eduardo Corletti just three months before facing Ali. 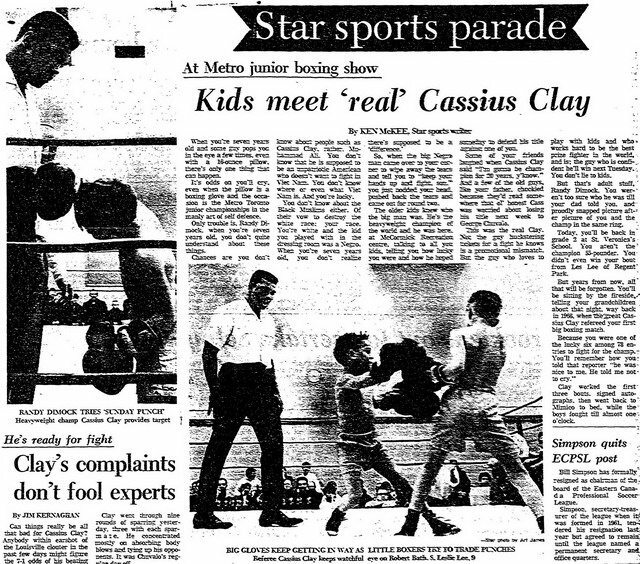 When news of the draft board hit the front page, Ali was scheduled to face Terrell in Chicago on March 29, 1966. But in mid-February, media pressure prompted the State of Illinois to cancel the bout when Ali not only refused to apologize for his anti-war statements but doubled-down at a special hearing before the state boxing commission. Right: Muhammad Ali, 1967, from WikiMedia Commons. 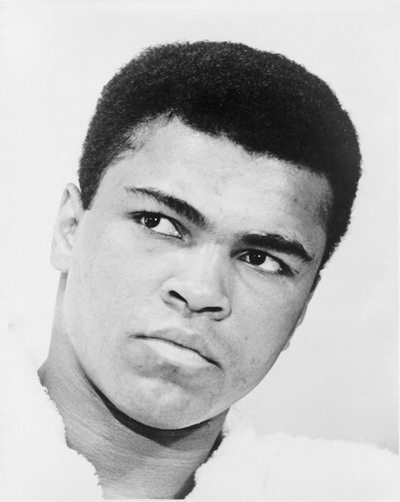 The offer from Louisville—Ali’s hometown—to act as a substitute venue came to naught when the Kentucky legislature hastily passed a resolution condemning the boxer as bringing “discredit to all loyal Kentuckians and to the names of the thousands who gave their lives for this country during his lifetime.” The promoters next tried Florida, Pennsylvania, Rhode Island, Oklahoma, Missouri, and elsewhere, but were rebuffed again and again through the refusal of state or local officials to sanction the bout. Although the Ali-Terrell fight was still without a venue just a month out, as the first fight to be promoted by Main Bout, Inc.—a company formed by Ali in association with the Nation of Islam—cancelling the fight was never an option. Main Bout didn’t need the the fight to be overwhelmingly profitable, but a failure to even stage the fight might prove a symbolic knockout blow for the Nation’s philosophy of economic nationalism. The eventual selection of Toronto was not without its own political controversy. In the legislature, MPPs debated not only Ali’s comments about Vietnam but also Terrell’s rumoured mob connections before officially sanctioning the bout on March 8. Conn Smythe, the builder and long-time director of Maple Leaf Gardens and a veteran of the Second World War, objected to the Gardens hosting a draft dodger. Denouncing the bout as “cash before class,” Smythe resigned as director and sold all his stock in the arena. Toronto Star (March 11, 1966). By this time, in the States, the Veterans of Foreign Wars had threatened to picket any theatre screening a closed-circuit telecast of Ali-Terrell. Of 280 theatres that had originally signed on for the March 29 event, only 32 showed the fight. Additionally, an American radio broadcast was cancelled over difficulties with sponsors. With the profitability of the boxing match plumetting, Main Bout pressured Terrell to accept a modified contract. He balked, objecting to the smaller purse being offered and unacceptable clauses in the contract, and backed out of the fight. With less than three weeks notice, on March 12 Chuvalo stepped up as Ali’s substitute opponent. Though he admitted he’d have preferred more time to prepare, Chuvalo would still manage to cram in 100 rounds of sparring before the fight. Ali arrived in Toronto on Saturday March 19—travelling with special permission of the draft board on condition that he be back stateside by April 17. With his trainers and entourage, Ali installed himself at Earl Sullivan’s Toronto Athletic Club on Ossington Avenue. Paying $1 to $5 each for the privilege, spectators crowded into the 300-person-capacity gym to watch the champion spar. Chuvalo’s gym at the Lansdowne Athletic Club was similarly packed—at 50 cents per head, with the proceeds donated to charity. Toronto Star (March 22, 1966). Cameras did follow him on an apppearance at the Metro Toronto junior boxing championship tournament a week before the Chuvalo event, where he refereed a few matches and offered consoling words for boxers discouraged by the outcome of their fight. “Be a champ,” he told the whole group of youngsters. “Work hard and get to be a champion and you may have to fight me. I’ll still be champ 20 years from now.” None of the kids posing for photographs with Ali or seeking his autograph seemed to care about the controversies then plaguing the fighter. 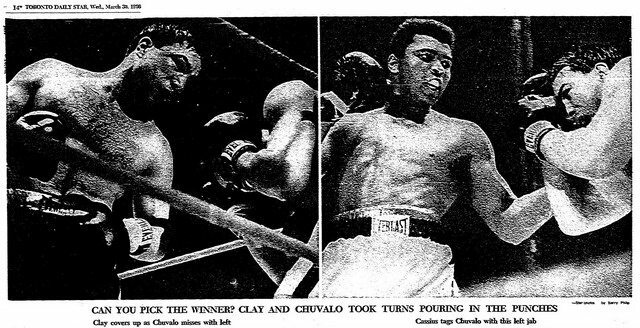 “Clay could have been the most popular of all champions,” Arthur Daley of the New York Times complained in the lead-up to the Chuvalo match-up. Left: Toronto Star (March 26, 1966). While Ali was regularly smeared as a disgrace to boxing by journalists, fellow boxers, and politicians alike for his anti-war views, the same critics had to at least acknowledge the 24-year-old’s boxing acumen. Chuvalo, four years his elder, received no such respect for his boxing skill. Foreign sportswriters labelled him a “second-class challenger,” and a “blocky, short-armed, plodding punching bag” who’d lost two of his last three fights. At best, they begrudgingly acknowledged that his durability—his willingness to accept punishment round after round—was a kind of boxing skill. At worst, they called him a mere brawler and a dirty fighter. The bout, they said, was a farce. Friendly local reporters scoured the boxers’ respective careers for glimmers of hope for Chuvalo. They latched onto his knockout of Doug Jones in February 1964—his last significant victory—which had so shaken his opponent that Jones was unable to fight again for over a year. Against the same fighter in March 1963, they noted, Ali won on points—a decision lustily booed by the crowd at Madison Square Garden who thought Jones deserved the victory. But even the local press gave little chance of a Chuvalo upset. Unofficial odds—if you could even find someone to take a bet on the fight—favoured Ali 7-1. 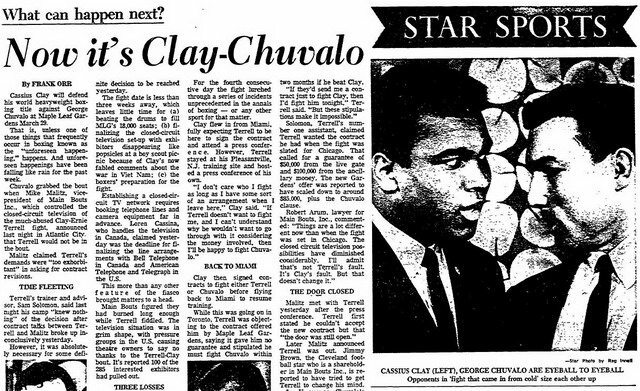 “I’m at my best as the underdog,” Chuvalo explained to the Star (March 15, 1966). “I’m a rough fighter,” he explained his planned strategy on another occasion. “When I’m in close, I feel that I’m the boss, and I try to make sure my opponent knows it. I’ll treat Clay as roughly as I can whenever I can. I plan to put pressure on Clay from the first bell and never let up. The hardest part of the fight for me will be the first 10 rounds. After that, he’ll be worn down. I think Clay will quit if he’s hurt, and I intend to hurt him.” As the shorter fighter, Chuvalo hoped—by relentlessly moving towards his opponent and preventing free movement about the ring—to overcome Ali’s advantages of greater reach and speed. The Ali-Chuvalo fight—hyped as “The Heavyweight Showdown”—was considered a joke by the boxing establishment. One journalist argued the bout would “reduce the status of the world heavyweight championship to burlesque,” and called Toronto a “city without sporting shame.” While few American media outlets showed any interest in the lead-up to the fight—and their correspondents arrived in Toronto only begrudgingly for the fight itself—local Star and Globe and Mail reporters filed almost daily reports from the respective training camps. They were there to record Ali’s characteristically poetic bluster. Although the boxing establishment complained the fight wasn’t worth 30 cents, nearly 14,000 spectators were willing to buy tickets, paying up to $100 for ringside seats. When the last-minute demand for $10 tickets exceeded the supply, Gardens officials ordered that $20 tickets be sold at half price to ensure no paying customer was turned away. The result, Palmer notes with reference to a New York reporter, was that the white-jacketed social establishment usually seen at Toronto boxing matches was largely absent. Instead, the crowd was comprised of working-class immigrants one might see in Yonge Street taverns—much like Chuvalo’s own background—and the likes of rock-and-roller Ronnie Hawkins. True to his pre-fight strategy, Chuvalo sought to make the bout an endurance test, concentrating on body shots—and more than a few low blows—to wear his opponent down. Ali let him, the Globe and Mail (March 30, 1966) reported, “almost disdainfully, allowing the Toronto slugger to pepper his body with plowing right hands—many to the kidneys and many low.” Although Ali would be peeing blood in the aftermath of the fight, Chuvalo’s efforts gave him no immediate advantage. While the bout was not a classic example of Ali’s free-wheeling style, the Star (March 30, 1966) observed, he relied on “perfect timing—offensively and defensively—moving forward, backward or to either side.” Ali didn’t tire after the tenth round as Chuvalo had hoped. And with the champion connecting on seven times as many punches as the challenger by one observer’s count, Ali was in command of the fight. It became clear to all in the late rounds that Chuvalo’s only opportunity to overcome his deficit on points—and to upset Ali—would be a knockout. Despite his renewed efforts in the final rounds, Chuvalo landed no decisive blow, and Ali won by unanimous decision. “The judges’ points are mere mathematics,” one British journalist remarked. “They convey not one tithe of the excitement that threatened to un-freeze the ice-rink floor as brave, bloodied, but ever unbowed Chuvalo bashed his way through to the 15th-round ditch.” By a combination of Chuvalo’s hard-headed unwillingness to fall down or relent, and the referee’s refusal to penalize him for his low blows, reporters argued, it was the toughest fight yet of Ali’s career. The international press issued a collective mea culpa over their pre-fight criticisms of the questionable nature of the match-up. “It was a far, far better show than anyone could have expected,” Jesse Abramson wrote in the New York Herald Tribune. Toronto Star (March 30, 1966). Chuvalo was disappointed at losing, and never quite understood why people thought he should be pleased with the fight. “When people say to me, ‘You must be so proud of this fight,'” Chuvalo told Stephen Brunt for Facing Ali: The Opposition Weighs In (Alfred A. Knopf Canada, 2002), “I say, ‘Proud of what? I lost the fight. '” But he eventually came to accept—and even feel pride—that his performance had made Canadians proud of being Canadian. The bout might have been a minor occurrence in Ali’s career, but one of a series of title defences—most staged on foreign soil—before he was convicted of evading the draft in June 1967 and subsequently stripped of his heavyweight belt. But for Chuvalo, facing Ali in the March 1966 bout—as well as their rematch in May 1972—was the defining moment of his career. The newfound respect going the distance with Ali earned Chuvalo from the boxing establishment prolonged his career, and he would go on to fight some of the greats of the era, like Joe Frazier, Jerry Quarry, George Foreman, and Cleveland Williams, before retiring—still Canadian heavyweight champion—in 1978. “He was the toughest man I ever fought,” Ali said of Chuvalo decades later. “He took all my best shots.” Chuvalo regarded Ali as the greatest heavyweight of all time. Chuvalo slipped from mainstream public consciousness until a series of tragedies involving drugs and suicide afflicted his family, at the cost of his wife and three sons in the 1980s and 1990s. He reinvented himself as a public speaker, discussing the perils of drugs to student audiences. His story will be the subject of his soon-to-be-released autobiography. Other sources consulted: Michael Ezra, Muhammad Ali: The Making of an Icon (Temple University Press, 2009); Jet (March 24, 1966); The Last Round (2003); and articles from the Globe and Mail (March 8, 9, 10, 11, 18, 22, 26, 28, 29 & 31, 1966); and the Toronto Star (March 8, 10, 19, 22, 25 & 26, 1966; November 1, 1992; November 13, 1993; January 8, 2002; and May 29, 2005).